Upscale Vancouver-baserd grocery retailer Urban Fare will open a store near Downtown Calgary. According to First Capital Realty, Urban Fare will anchor a 110,000 square foot retail/commercial building adjacent to Mount Royal Village. This will be Urban Fare's only existing store outside of British Columbia, though not the first time it has opened a store in Alberta. Urban Fare is owned by Overwaitea Food Group which belongs to Vancouver-based Jim Pattison Group. Jim Pattison was recently declared to be the wealthiest person in Canada. Urban Fare currently has five store locations in British Columbia: four in central Vancouver, and one in Kelowna. Urban Fare's first store opened in 1999 at the base of an upscale condominium complex named Aquarius in Vancouver's Yaletown neighbourhood. The 25,000 square foot store was immediately popular. A second location opened in Edmonton's upscale Crestwood neighbourhood in 2001, only to close in 2004 because of poor sales. A 21,500 square foot store opened in 2007 at the base of the Cielo condominium tower in Downtown Vancouver's wealthy Coal Harbour neighbourhood. In November 2008, a third Downtown Vancouver store of 22,000 square feet opened at the base of the Shangri-La Hotel and Residences (Vancouver's tallest building) on West Georgia Street, mere blocks from the Coal Harbour store. A fourth Vancouver store of about 23,000 square feet opened in the summer of 2012 at the city's Olympic Village, and a 31,000 square foot Kelowna store also opened in 2012. Competitor Whole Foods has also been looking at opening stores in the Calgary market. Whole Foods intends to open about 40 Canadian stores over the next few years. Given the arrival of a Calgary store as well as recent openings in Vancouver and Kelowna, Urban Fare may be on a nation-wide (or at least a Western Canadian) store expansion. We'll update you when we learn more about Calgary's new Urban Fare, and also when we have details on Whole Foods' likely entry into the Calgary market. "Calgary", "First Capital Realty", "Mount Royal Village", "Urban Fare", "Whole Foods"
Sources tell us that Holt Renfrew will be opening the fourth floor of its Calgary store for retail, including a new restaurant and a combined mens/women's shopping area called 'Holts Commons'. The fourth floor restaurant is said to open in early 2014. When Holt's opened its Calgary store in October 2009, it left its fourth floor shuttered so as not to 'overwhelm' the Calgary market with a store more than triple the size of its previous Calgary store. When its huge Vancouver replacement-store opened in 2007, sales struggled as shoppers adjusted to the new, larger (Neiman Marcus-like) format. Holt's subsequently figured its Calgary location should 'graduate' to a larger size as it saw sales increase. On opening day, the 25,494 square foot fourth floor of Calgary's Holt Renfrew laid vacant while shoppers were introduced to the stunning 121,400 square foot store below. When the fourth floor opens next year, Calgary's Holt Renfrew will be the second largest in the chain at 146,887 square feet (second only to the Toronto flagship store). Vancouver's Holt Renfrew will fall back to be third largest at about 140,400 square feet. More changes will be coming to Calgary's Holt Renfrew store. We'll be announcing them periodically as it grows into its enlarged store space. Will Saks Fifth Avenue Open in Calgary? "Calgary", "Folli Follie", "Holt Renfrew"
TopShop/TopMan opens tomorrow at Calgary's Chinook Centre. The store will be about 15,000 square feet and will be adjacent to its franchise owner, Hudson's Bay. There's no word yet as to if TopShop/TopMan will open a full-sized store within Downtown Calgary's Hudson's Bay store or at any other suburban locations. Downtown Calgary's Hudson's Bay carries some collections but does not yet feature the large TopShop stores found within some other Hudson's Bay flagships. This is the latest popular retailer to open at Chinook Centre. Other recent additions to the mall have included J. Crew, Hugo Boss and Eileen Fisher. Nordstrom will also open its first Canadian store in the mall next year. Chinook Centre is one of North America's most productive malls. It sees sales of almost $1,100/square foot/year and by 2016, it is expected to have annual sales of close to $1 billion with non-anchor sales of about $1200/square foot. In addition to a recent expansion and the opening of Nordstrom, the mall will be undergoing a further expansion that will include an outdoor 'town centre' environment. "Calgary", "Chinook Centre", "Hudson's Bay", "TopMan", "TopShop"
Calgary's downtown Hudson's Bay store turned 100 years old this week, and it will substantially reduce its retail space both on its ground floor as well as its top level. Ground floor space will be lost to a restaurant, while the top level will eventually be entirely devoted to an event facility. A 7,500 square foot restaurant will occupy the south-west portion of the store's ground floor, and a further 4,000 square feet of basement space will be devoted to a lounge. Given that each floor of the Hudson's Bay store is about 50,000 square feet, the restaurant represents a loss of about 15% of the store's ground-floor retail space. Ground floor retail space, in cities where pedestrians primarily access retail from the street, is considered to be prime. Hudson's Bay recently removed men's furnishings on the ground floor of its flagship Toronto store to open one of the world's largest shoe floors. We've been told shoe sales have been stellar, and that the floor expects sales in excess of $1,000/square foot. In Calgary, on the other hand, many shoppers use a series of elevated walkways to access downtown retail. The entire sixth floor of the store will eventually be dedicated to an event space. Including the ground-floor restaurant, Hudson's Bay will reduce the downtown store's retail space by about 20%. Despite Calgary's wealth and population, downtown Calgary's Bay store lacks much of the luxury found in its Toronto, Vancouver and (soon) Montreal stores. Toronto and Vancouver Hudson's Bay stores include ~20,000 square foot luxury women's departments called The Room, and Montreal will open The Room next year as well. Toronto's Hudson's Bay has an in-store Burberry boutique, and several more productive Bay flagships are seeing partial or complete overhauls. Calgary's downtown Bay lags behind these, partly due to its proximity and lack of connectivity to the popular Core Shopping Centre located downtown, which includes considerable retail and a large and luxurious Holt Renfrew as its anchor. Hudson's Bay is leasing space in its stores to make way for new concepts, including retailers and restaurants. It leased 20,000 square feet on the 7th floor of its flagship Toronto store to NYC-based Kleinfeld Bridal, and it could eventually open Kleinfeld in Calgary. 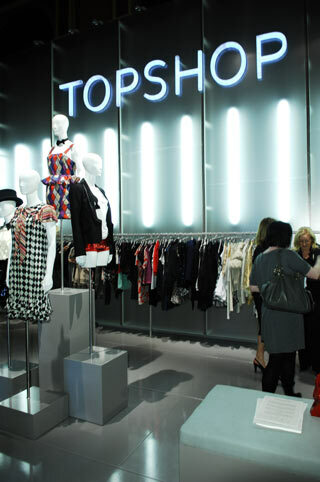 Hudson's Bay has dedicated substantial square footage to TopShop at several of its stores, though these are HBC-owned franchises. Saks Fifth Avenue will soon take the largest chunk of existing Hudson's Bay retail space, expected to be in the hundreds of thousands of square feet. Restaurant space has and will continue to be added to other Bay stores, though not to the same degree as in this Calgary location. Time will tell how much retail space Hudson's Bay will reposition in its existing stores. On the plus side, the aforementioned ground-floor restaurant will include what could become Calgary's largest outdoor dining patio. And the sixth-floor event facility will no doubt be popular and be very useful for those seeking event space. Being Retail Insider, we don't generally report on restaurants. The restaurants are expected to be excellent, however, and we direct you to this press release for more details on what will likely become a very popular dining and event location. Vancouver based Plenty will open its first store outside of British Columbia next month. It will be located in Calgary's Chinook Centre. The store will be about 2,400 square feet and will be located on the mall's second level near the new Nordstrom store, currently under construction. For those unfamiliar, Plenty is a women's and men's multi-brand retailer. It was started in 1989 and carries private label merchandise as well as other designer labels. It has four stores in the Vancouver area and one in Victoria. Calgary will therefore be Plenty's sixth store location. Thank you to our source Ryan, aka Mr. Fabulous, for providing us with this tip. You can find his blog here: http://immrfabulous.com and you can follow him on Twitter. Saks Fifth Avenue could open in Calgary, and it could open either downtown or at the Chinook Centre. A Calgary store could follow Saks openings in Vancouver and Toronto, which are expected to open first according to HBC CEO Richard Baker. Calgary cold be considered a prime city for Saks Fifth Avenue. It has over 1 million people. Salaries are high and income and other taxes are relatively low compared to the rest of Canada. We would expect a Calgary Saks store to be, at least initially, located within existing Hudson's Bay store space. More specifically, we'd likely see Saks either within the flagship Downtown Calgary Hudson's Bay store, or somehow integrated into the current Hudson's Bay store, now under renovation, at Chinook Centre. Locating within existing Hudson's Bay space would be much more cost-effective for Saks as HBC owns its Downtown Calgary store and has an excellent long-term lease at its Chinook Centre store. As an aside, we're not sure if Hudson's Bay's opening one or more "Saks departments" within its existing stores would be a good idea. Saks stores are noted for their customer service and attractive store interiors. Hudson's Bay stores have not traditionally been known for either. The Saks brand could be damaged if it is placed too commonly within existing Bay stores, and we think segregating the two would be better for the Saks brand. With Richard Baker's recent assertions that Hudson's Bay would become "Canada's Harrod's" with the inclusion of Saks, we're concerned that random Saks spaces within Hudson's Bay stores could seriously harm Saks Fifth Avenue's image both to Canadian shoppers as well as internationally. The Downtown Calgary Hudson's Bay store is about 450,000 square feet over six levels. Its 75,000 square foot floorplates allow for some flexibility with the possible inclusion of Saks occupying one or more floors. Saks could also possibly occupy some of several floors or even include smaller "Saks departments" throughout the downtown store. The Bay store faces several challenges for Saks. It's separated from Downtown Calgary's main shopping Centre, The Core, by an adjacent shopping plaza called Scotia Centre. Scotia lacks the attractive interiors of the neighbouring Core, and its connection to Hudson's Bay lacks both attractiveness and convenience of entry. Calgary's downtown retail is dominated by above-ground pedestrian walkways and because of this, a Saks within the downtown Bay could be less than ideal. On the flip side, bringing Saks into the Downtown Calgary Bay could bring more shoppers eastward from The Core. A benefit to the location of Downtown Calgary's Bay is that it is located across the street from the upscale shopping strip called Fashion Central, which includes upscale retailers such as Wolford. Saks could be an interesting addition if located across from Wolford at the corner of 8th Avenue Southwest and 1st Street Southwest. Furthermore, Saks could also increase the demand to remodel Scotia Centre to include better retailing, services, access and interiors. A Saks in Downtown Calgary would join a 147,000 square foot Holt Renfrew store and would compete with a 31,000 square foot Harry Rosen store in the menswear category. Hudson's Bay's Chinook Centre store is about 203,000 square feet. A full-sized Saks store would ideally be in the 75,000-130,000 square foot range. Given this, we would expect a smaller Saks shop-in-store at the Chinook Hudson's Bay store, if at all. Chinook Centre will be expanding near the current Hudson's Bay store and from the plans we have reviewed, we don't see an allowance for another anchor store. Chinook Centre is one of Canada's top malls, and next year it will open Canada's first Nordstrom store. The 140,000 square foot Nordstrom will be a huge draw to the mall, and Saks could be a welcome addition as a fourth anchor store for Chinook (joining Hudson's Bay, Nordstrom and a recently opened Target store). There would be at least two benefits to opening Saks at Chinook. One is the availability of ample parking in a city that loves its cars and has expensive downtown parking. The other is the lack of competition from Downtown Calgary's Holt Renfrew store, which includes some of the same concessions carried at Saks, ie. Louis Vuitton, Chanel, Dolce & Gabbana, and Prada, among others. Given the affluence, population and low taxes in Alberta, we'd be surprised if Calgary didn't see a Saks location either downtown or at Chinook Centre. "Calgary", "Chinook Centre", "Holt Renfrew", "Saks Fifth Avenue"
Greek accessories and jewellery company Folli Follie will continue to open more Canadian shops. The latest will be a location on the 2nd floor of Holt Renfrew's Calgary store, according to a source at the Vancouver store. The Calgary shop will be located in the women's 'contemporary' department, and is expected to open mid-August. Its first Canadian location opened within Vancouver's Holt Renfrew store in October 2011. Concessions have followed at Holt Renfrew's Bloor Street and Sherway Gardens stores in Toronto, as well as a location at the Vancouver International Airport. Folli Follie's prices are considered relatively 'affordable' by designer-goods standards. We enquired why the concession was at Holt Renfrew rather than Hudson's Bay. Were informed it is because Folli Follie is owned by the same company as Links of London which already has concessions at Holt's stores across Canada. Calgary's Chinook Centre is planning for yet another expansion. The south-east corner of the mall's site will eventually be redeveloped and could include an anchor retailer as part of the expansion. The entire project would include retail, office space, a hotel and residential space. The redevelopment would coincide with proposed transit-friendly development around the nearby Chinook Station light rail transit ("LRT") hub. The mall expansion, specifically, would see parking moved underground and a more 'pedestrian friendly' environment created at ground level. The proposed mall expansion will go to vote by the Calgary Planning Commission this Thursday (June 6th) and we'll let you know the outcome. We have been informed by one of our Calgary insiders that it is expected to pass, given that Calgary's Corporate Planning Applications Group has recommended that it be approved. Diagram showing proposed mall expansion area, as well as proposed Chinook Station LRT area redevelopment. In September 2010, Chinook Centre saw the opening of a $277 million, 180,000 square foot expansion. The mall has since firmly established itself as Calgary's premier suburban shopping destination. It secured the future opening of Calgary's only Nordstrom location, which is expected to open late September 2014. It has also scored first-rate retailers such as Burberry, Tiffany & Co. and Tory Burch. We have been following the mall's expansion proposal for several months and we're expecting renderings and more specific proposal information in the coming days. Chinook Centre is one of North America's most productive malls. It has sales of almost $1,100/square foot and by 2016, it is expected to boast sales of close to $1 billion with non-anchor sales of about $1,200/square foot. These numbers come from this Calgary Herald article. We'll update you on Chinook Centre's expansion proposal as we get more information. On Saturday, Paris-based ready-to-wear retailer Zadig & Voltaire will open men's and women's shop-in-store locations inside of Holt Renfrew stores in Toronto (Bloor Street), Vancouver, Calgary and Montreal. Zadig & Voltaire was started in 1997 by the grandson of the founder of Lacoste. The brand's products are in the 'contemporary' or 'bridge' price ranges. The brand has become popular and is considered to be 'fashion forward'. Zadig & Voltaire has stores around the world, both free-standing and shop-in-store concessions. The company has five free-standing American stores, and has shop-in-store concessions at nine American Bloomingdale's locations. "Calgary", "Holt Renfrew", "Montreal", "Toronto", "Vancouver", "Zadig et Voltaire"